Getting crits with Crew Skills just seems more and more important. Not only do most of my slicing profits come from mission discoveries (found on a slicing crit) - but I'm also busy crafting items with augment slots (Rakata relics, lvl 49 implants...) and want some sense of how tough it'll be. And come 1.2, I'll want some critically-crated moddable gear (weapon / vest / legs / helm), for a free augment slot - something that was confirmed in the Guild Summit. To take a look at how companion affection influences crew skill crits, I ran just over 1000 slicing missions on characters with 400 slicing, using companions with a wide range of affection. Each point is a slicing mission, color coded by companion. Triangles are crits, circles are not. The red line is the predicted probability of a crit for a given level of affection, and the shaded region is its 95% CI. In short: companion affection really, really, really makes a difference. While companions with no affection have about a 13% chance of a critical success, companions with 10,000 affection have a 20% chance - even without a bonus. Curiously, mission yield didn't influence chance of a critical mission. Excluding bountiful missions - I didn't run enough to get a good estimate - all mission yields had approximately the same percentage chance of a crit, whether in the raw data (table below) or included in a logit model (with controls for affection, whether the companion had a critical bonus, and mission yield). I did notice, however, that running lower-level missions while at 400 slicing (say, the rank 5s) yielded a higher chance of a crit than running the max-level missions (by about 1% - so take this with a mountain of salt). 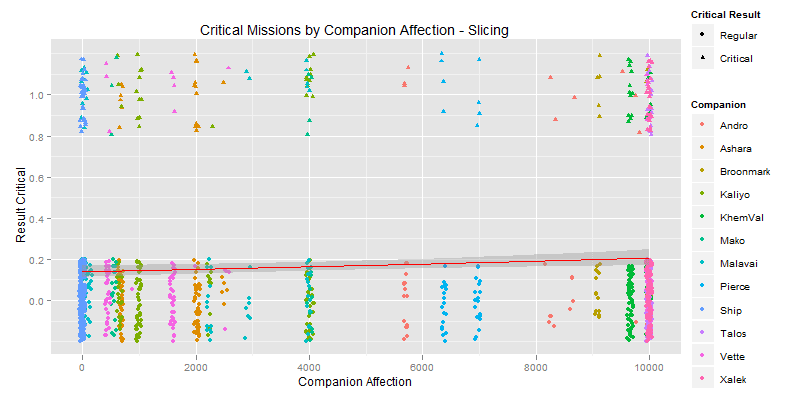 TLDR: companion affection dramatically improves the chance of getting a critical success on a mission. Yield does not appear to matter. The class of the class of mission may have a (minor) effect. One thing I should note is that I get ridiculously streaky crits across my companions (if one gains a mission discovery, the others are more likely to than should happen by chance). I'm still unsure whether this is a programming quirk, an artifact of the data, or what. *For a look at companion affection and crafting efficiency, pdxmarcos on the forums has a great guide, and an excellent spreadsheet.